Helping to start the new school year Friday at RVH are Melody Boyd, operations director, Regional Cancer and Mental Health & Addictions Programs; Peter Beacock, Simcoe County District School Board chair; Janice Skot, RVH president and CEO; Heather Cochrane, manager of Adult Crisis Services and the Simcoe Muskoka Regional Child and Youth Mental Health Program; Michael O’Keefe, chair, RVH board of directors; and Dr. Eric Mulder, RVH’s chief of psychiatry. BARRIE — On Friday, Sept. 7, the first four students began classes at the new Royal Victoria Regional Health Centre (RVH) mental health day school. It is a service of the Simcoe Muskoka Regional Child and Youth Mental Health Program, in partnership with the Simcoe County District School Board (SCDSB). It provides academic and mental health services for high school students unable to attend regular classes due to a diagnosis of anxiety or depression. The goal is to transition the students back to their community high school. Six more students will join them by the end of the month. The teens in Grades 9 to 12 will have the reading, writing and math found in a traditional school, with the added bonus of recreational therapies and mental health counselling. One of the unique features of this service is that students attend during the day and return to the their own homes in the evening. “We know that a teenager’s mental health is just as important as their physical health and they deserve the same quality of care and access to support,” says Janice Skot, RVH president and CEO. “One year ago, hospital-based mental health services for troubled kids weren’t available anywhere in this region. 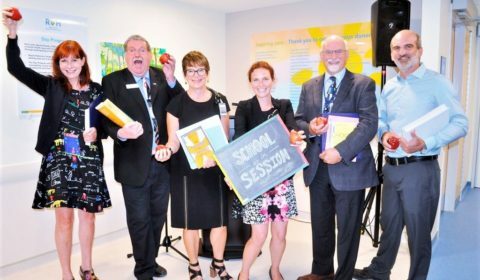 Since our regional program opened 10 months ago, almost 300 young people have been cared for in the eight-bed inpatient unit,” Skot said in a release announcing the day school. To establish the program required partnerships with the Simcoe County District School Board, Eastview Secondary School, Innisdale Secondary School, the Simcoe Muskoka Catholic District School Board, Kinark Child and Family Services and New Path Youth and Family Services – Lead Agency for the provincial government’s Moving on Mental Health for Simcoe County. “The SCDSB is really excited to partner with RVH for this new program, supporting adolescents aged 14 to 18 who are struggling with mental health issues,” says Peter Beacock, Simcoe County District School board chairperson.